Inhibitory control is considered to be one of the key factors in explaining individual differences in trait anger and reactive aggression. Yet, only a few studies have assessed electroencephalographic (EEG) activity with respect to response inhibition in high trait anger individuals. The main goal of this study was therefore to investigate whether individual differences in trait anger in forensic psychiatric patients are associated with individual differences in anger-primed inhibitory control using behavioral and electrophysiological measures of response inhibition. Thirty-eight forensic psychiatric patients who had a medium to high risk of recidivism of violent and/or non-violent behaviors performed an affective Go/NoGo task while EEG was recorded. On the behavioral level, we found higher scores on trait anger to be accompanied by lower accuracy on NoGo trials, especially when anger was primed. With respect to the physiological data we found, as expected, a significant inverse relation between trait anger and the error related negativity amplitudes. Contrary to expectation, trait anger was not related to the stimulus-locked event related potentials (i.e., N2/P3). 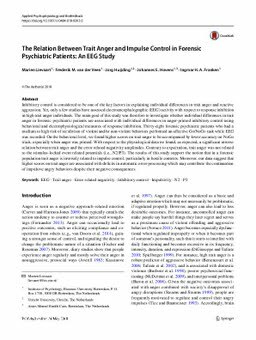 The results of this study support the notion that in a forensic population trait anger is inversely related to impulse control, particularly in hostile contexts. Moreover, our data suggest that higher scores on trait anger are associated with deficits in automatic error-processing which may contribute the continuation of impulsive angry behaviors despite their negative consequences.